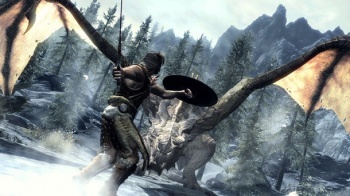 The first two DLC releases for The Elder Scrolls V: Skyrim will be timed exclusives for the Xbox 360. We have no idea what Bethesda has in store for Skyrim DLC - Skyrim itself won't be out for another two-and-a-half months - but whatever it turns out to be, it'll be Xbox 360 owners who get to play it first. The publisher announced today that the first two DLC releases for the upcoming RPG will come out on the 360 30 days before they're available on any other platform, which is to say, the PC and PlayStation 3. It seems a bit silly to announce that DLC will be timed exclusives before revealing anything at all about the DLC itself and especially so far ahead of release, but it does give a bit of a nudge to gamers who are committed to the game but wavering on the platform. Given the apparent importance of preorders these days, I suppose the way-in-advance announcement isn't all that surprising. Back in June, Executive Producer Todd Howard said Bethesda wanted Skyrim DLC to be bigger and more substantial than it had been for games like Oblivion and Fallout 3. "We don't know what we're going to make yet, but we'd like them to be closer to an expansion pack feel," he said. The Elder Scrolls V: Skyrim comes out on November 11 for the PC, Xbox 360 and PlayStation 3.